Image the effect of having your own promotional label on bottles of award winning champagne. Memorable and delicious, certain to make a big impression. Choose from a wide range of quality champagnes and sparkling wines to suit all occasions. From miniature bottles to magnums, and all sizes in between. Whether you want a stunning Premier Cru champagne or a simple bottle of fizz, whether you need an aperatif for your event or a celebratory bottle for your staff, Euromarque have a bottle of something for everyone. The best range of award winning promotional champagnes. Your own unique artwork on the full colour label. Whether you want full branding, an invitation, or an eye-catching image, there are absolutely no design restrictions. You are welcome to provide your own complete high resolution label artwork. 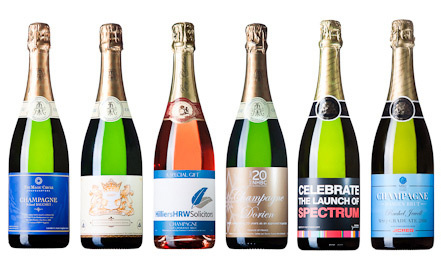 Promotional Champagne Labels for your business. Full colour corporate branding on great bottles of wine. 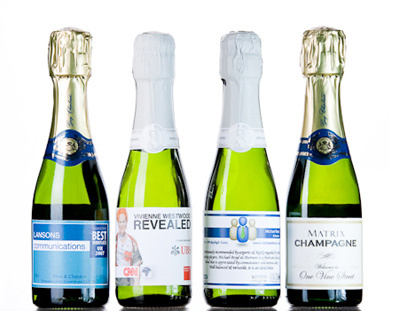 Little bottles of promotional champagne and sparkling wine with Branded Labels in full colour. The perfect exhibition and event promotional giveaway. Remember that every bottle of your lovely promotional champagne will have your own full colour promotional label.